We keep hearing about some sort of $20 million bonus that might be in the works for any driver who wins the Indy 500 and Coca-Cola 600 in the same day. That’s a lot of baloney. Expensive baloney, granted – but still baloney. It was a goofy ideal back in years past when a handful of drivers tried it, and it’ll be a goofy ideal if somebody tries it again in the future – no matter how gold-plated it may be. It’s purely a sideshow gimmick, and officials of both races should be ashamed to be a part of it. What’s next – offering $20 million bonus to any jockey who can win the Kentucky Derby riding a mule? The Indy 500 is arguably motor sports’ greatest single spectacle, a storied race that supposedly pushes man and machine to the utmost limits. If that’s so – if they truly give everything they’ve got to their effort at the Brickyard – then what’s left over? How can they possibly hop a plane, fly to Charlotte, and run another race later that day? And it’s not just another race. 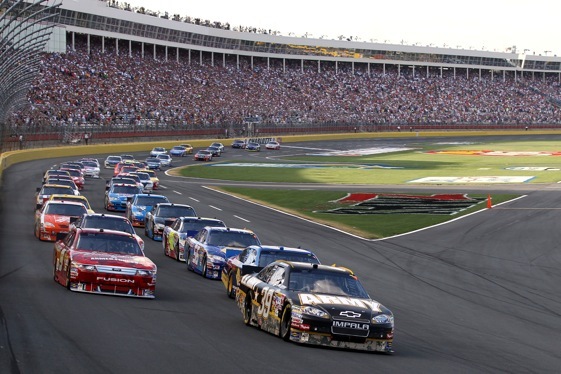 It’s NASCAR’s longest race, 600 grueling miles. We always hear drivers talk about how draining and demanding the 600 is, about how they have to dig down deep to come up with enough energy and stamina and will to make it to the end. And yet some have gone into the 600-miler after running 500 miles at Indy. How absurd. I said it then and I’ll say it now: Any driver who attempts the Indy-Coke doubleheader is selfishly short-changing both his teams. Driving the Indy 500 requires total focus; a driver can’t be screaming around the track while looking at his watch and wondering if he’s going to have time to catch his plane to Charlotte. He may not do it literally, but in the back of his mind he knows he has a tight schedule to keep, and that means he’s not totally concentrating on the job at hand. It’s even worse when he gets to Charlotte Motor Speedway, having been up since dawn and immersed in the swirl and chaos of Indy. Logging 500 miles in one of racing most demanding, pressurized events is hardly an ideal way to prepare for another 600 miles of racing. A driver who’s run 500 miles at Indy can’t possibly give his best effort, physically and mentally, later that day at Charlotte. And if he can’t give his best effort, then he’s short-changing his team, his sponsors, his fans and his sport. Running both races doesn’t show a driver’s determination, its shows his lack of dedication. And all for what? To be part of a gimmick. The $20 million “bonus” is, of course, a sham; a driver has to win both same-day races to collect it. What are the odds of that? That’s not a bonus, that’s a carnie shell game. If a driver needs money that badly, maybe he should try pro wrestling. I hear that it pays pretty well, and at least it’s up-front about its phoniness. Green. white checker. Wave around. Giving lucky dog lap. Stopping race every 30 laps or more to tighten up race and let crew work on cars. Pits closed to tighten up race. Perfectly OK to hit and or wreck car in front of you to make pass. Cars make race that are to slow on speed to qualify while faster cars go home. Now that is baloney, not racing. These are rules for dim fans who do not know how to watch a race unfold. These rules are what contribute to the bad show, not make good racing. Racing has been replaced by entertainment. The more you water it down the worse it will get. And you chime about a bonus. Didn’t get your point, if there was one.